Master magician, Steve Martin performed a neat trick Friday night at Eugene’s Hult Center for the Performing Arts—he twisted a blazing-hot bluegrass band (Steep Canyon Rangers), a “notorious” singer/songwriter (Edie Brickell) and his own show-biz savoir-faire into an entertaining, vaudevillian blend of musicianship and comedy. Martin’s current act evokes a nostalgic, medicine show quality with its catch-all, “cure-what-ails-you” elixir of humor, poetry and song. 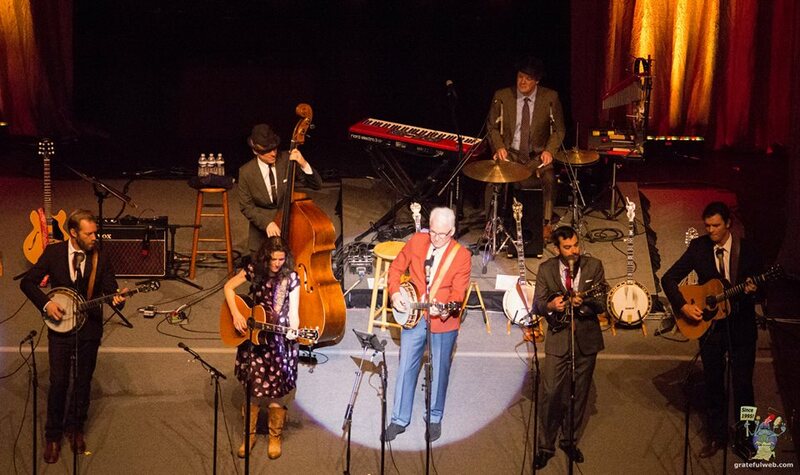 Friday’s concert began cordially with Katie Mae’s inviting proposal to ”go down to the church and make it real.” The Steep Canyon Rangers’ considerable contributions were immediately apparent in the cool, Appalachian textures of their three-part, vocal harmony, and the striding, confident tempo of their four-five-six-and-eight- string prowess. 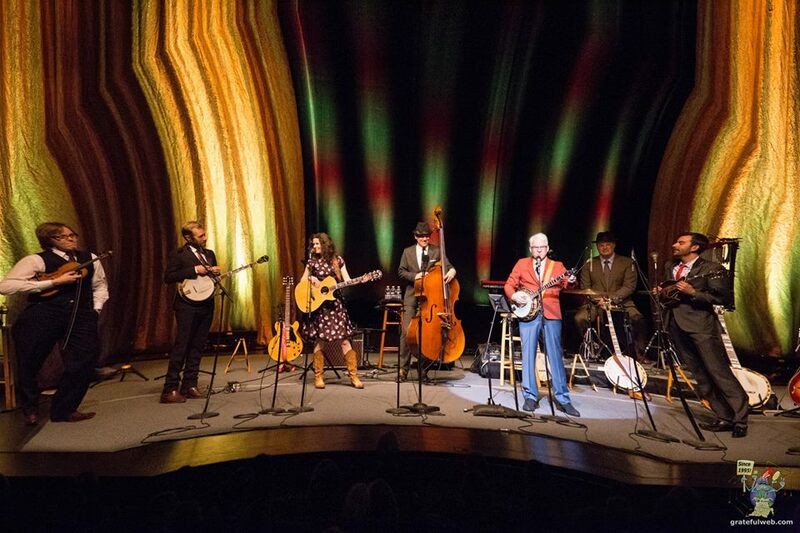 SCR is a traveling band of professionals whose business is bluegrass, and from the show’s outset, they earnestly went to work. These amusing asides softened the audience, assured them they were in the right place, and suitably prepared them for something new. The (comic) material was not “fresh” but rather familiar, satisfying the crowd’s expectant curiosity for the “real” Steve (an intriguing notion that would be transformed over the course of the evening). Martin’s music is a lot like Martin himself, a mixture of parody and sincerity; silliness and intelligence; sharpness and sentiment. The show’s third tune, Jubilation Day, duly demonstrated it all. My shrink gave his O.K. The instrumental, title track from their Grammy award-winning album, The Crow, followed and underlined Martin and the Rangers’ capacity for rendering authentic High Lonesome with a fresh Sound. The Rangers’ fiddler, Nicky Sanders, mandolinist, Mike Guggino, and banjo player, Graham Sharp all took raucous turns on The Crow, but Martin was also really good. He's been playing banjo for 50 years, and Friday night he demonstrated an easy mastery over the instrument, performing both Scruggs (three-finger) and claw hammer styles. Martin's technique is smooth and clean; perhaps lacking some scruffy, backwoods flavor, but smart, tastefully concise and meticulously executed. The introduction of Edie Brickell catapulted the show in a decidedly dreamier, less sarcastic direction. Her first interjection was the pastoral, country porch-song, Get Along Stray Dog. Its snapshot narrative turns around a home-prepared meal that can’t be missed by neighbors or strangers, far and wide, to the annoyance of its matriarchal cook. Brickell’s own subtle sense of humor reveals itself in the vividly imagined characters of her not-so-tall-tale rather unlike Martin’s more-pronounced reflective musings. Her creative presence balances and stretches Martin’s artistic vision, elevating the show to inspired, pleasing, new heights. These co-written compositions, largely from Martin and Brickell’s 2013 release, Love Has Come for You, were augmented by keyboard, percussion and electric guitar (seamlessly provided by the accommodating Rangers). This added lushness pushed the music beyond a constricting “bluegrass” categorization toward something more fluid and contemporary. Brickell’s distinctive voice and poetic sensibilities add significantly to Martin’s musical ideas, and these soulful collaborations provided the creative peak of Friday’s concert. Another beautiful story-song, Sara Jane and the Iron Mountain Baby, and the Grammy award-winning title-track from Love Has Come for You completed Brickell’s first sparkling interlude as she and Martin briefly departed to appreciative applause. The musical virtuosity continued to assert itself relentlessly as the show unfolded, and Stand-Up Steve became a less necessary component of the act's appeal. Martin's familiar, comedic postures eventually morphed into something like an interloping impresario—"They're not my band. I'm their celebrity." The waves and gestures to his comic reputation became rightfully supplanted by the business at hand, the real reason for coming—wonderful, heartfelt music. A not- entirely surprising revelation took shape—Martin writes songs and plays banjo as good, or even better than he tells jokes. Martin, Brickell and the Rangers produced several more quality moments including Dance at the Wedding, Brickell’s stirring Fighter, the “new, murder ballad,” Pretty Little One and the set-closing epic, Auden’s Train. Enough has not been said here about the Steep Canyon Rangers who rightfully deserve their own top-billing. But, as Martin himself might say, “They’re not Steve Martin.” Nevertheless, their talent demands the highest recommendation, and they should be sought-out, listened to and monetarily rewarded for their sterling efforts. This show simply would not have been as enjoyable without their first-rate accompaniment. 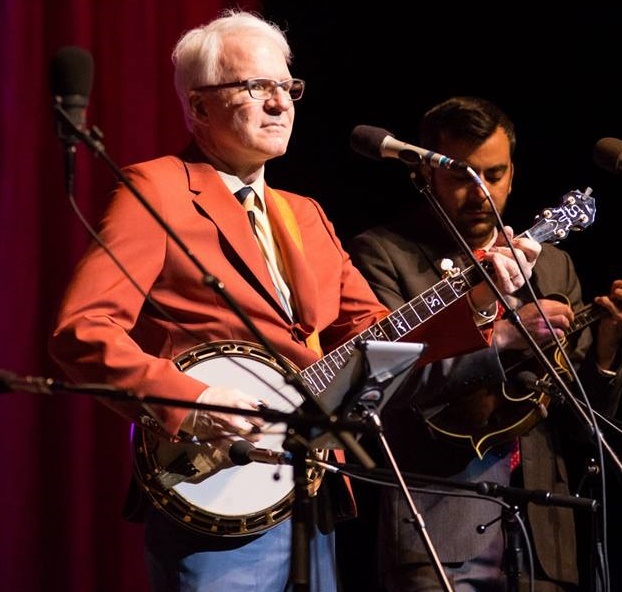 Steve Martin has, throughout his successful career, largely compensated for a self-professed fear of being talentless by acquiring and masterfully demonstrating a dizzying array of diverse talents. His current package show doesn’t disappoint as he continues to explore new ways to cleverly astound. 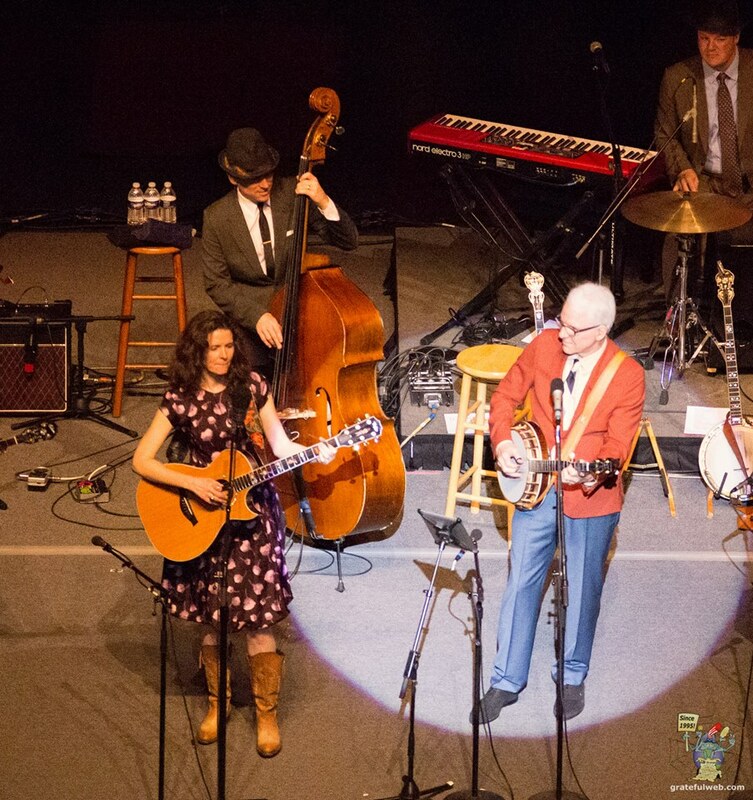 Martin, Edie Brickell and the Steep Canyon Rangers are not to be missed.